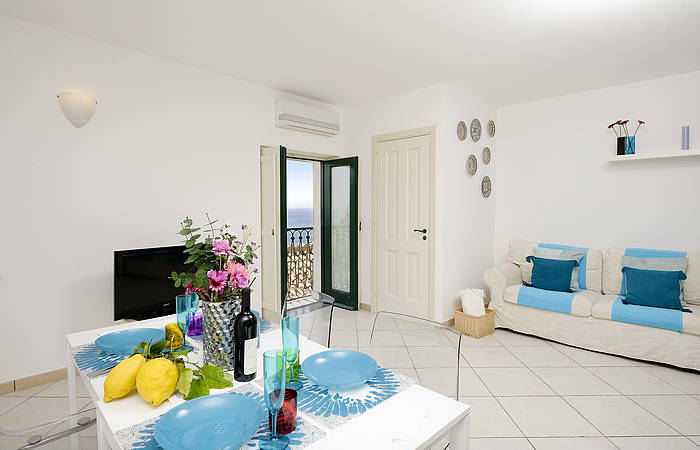 Ananas is a self-catering apartment in the center of Minori boasting a spacious living room with a view of the Mediterranean Sea, a kitchen and dining area, and a bedroom overlooking the Cathedral. 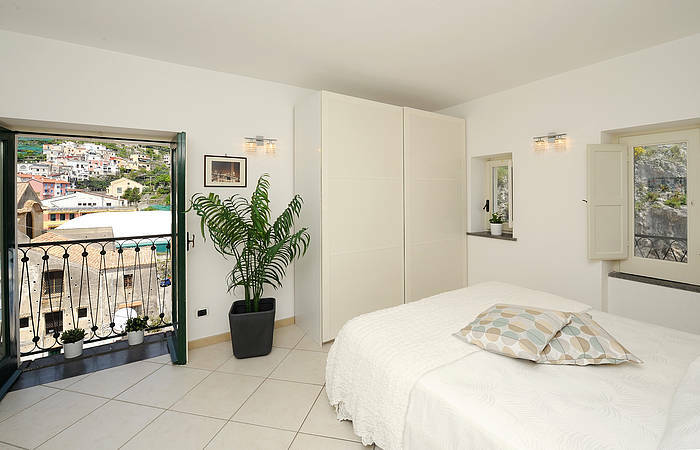 If you are looking for a vacation home in Minori, Ananas is the perfect Amalfi Coast apartment for you. 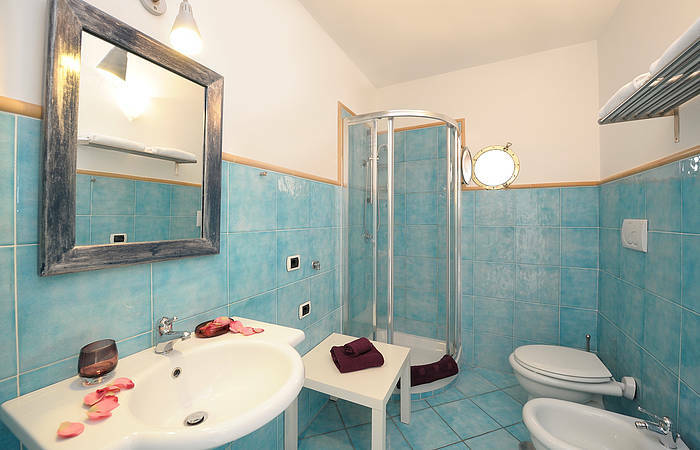 Ananas is located in a restored historic palazzo in Minori, comfortable, roomy, and bright, the apartment has a bedroom, bathroom, and can host up to 4 guests as the living room has a sofa bed for two, if needed. The entire apartment is air conditioned, and has internet, television, and a stereo. In addition, there is also a walkin closet and a small, fully stocked utility closet/laundry room. 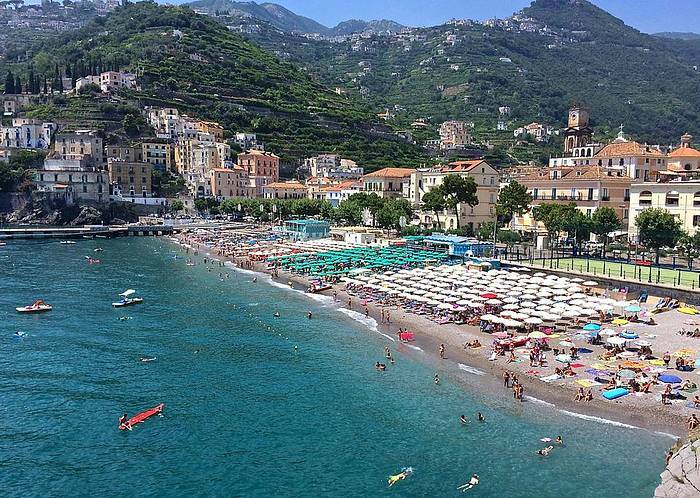 Minori's large sandy beach is located right across the street, so you have the Amalfi Coastline right at your feet! 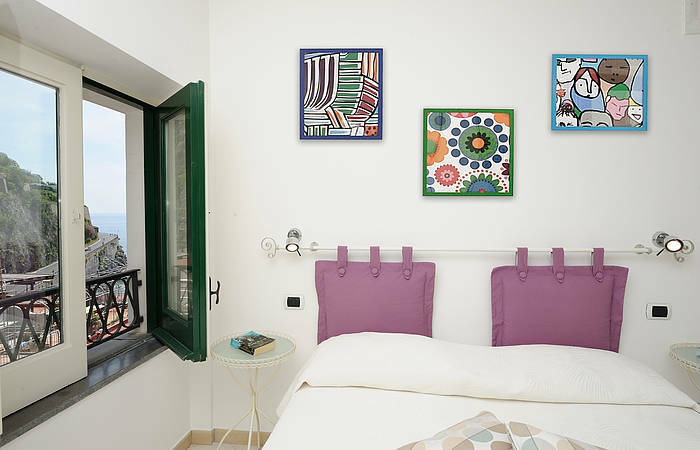 The apartment is in the center of Minori, just steps from restaurants, cafes, boutiques, shops, and grocery stores. You can easily walk to everything you need. Ananas is located on the fourth floor, there are 120 steps up to the apartment (there is no elevator), but once you've reached it, you'll feel right at home. Parking at the daily rate of Euro 20 (for a car) - Euro 25 (for a van/minivan). 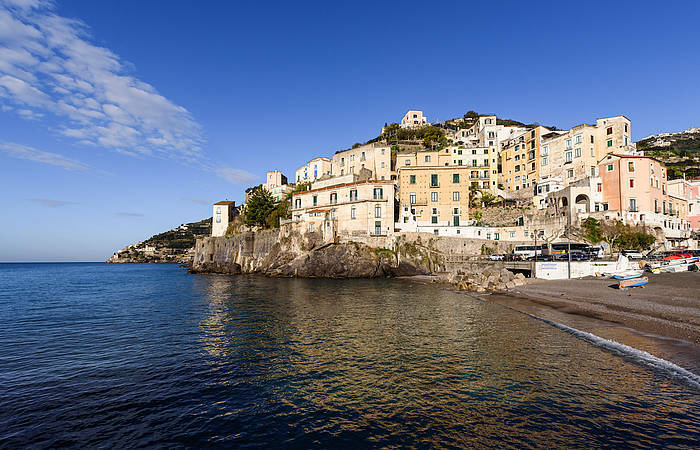 Minori is a small fishing village on the Amalfi Coast, and the ideal location for travellers who love the seaside. You can spend your days basking and bathing on the large local beach, enjoy authentic small town life, and sample the best local wine and food in the excellent nearby restaurants and bakeries. 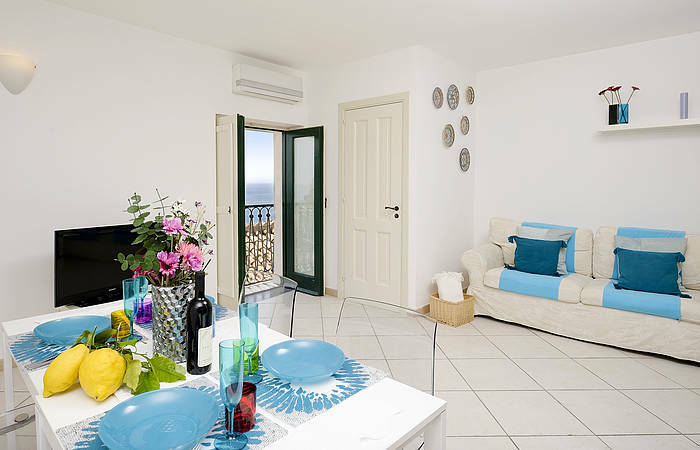 Amalfi is just 4 km from Minori (2,4 miles), and can be reached by car, bus, taxi, or ferry. 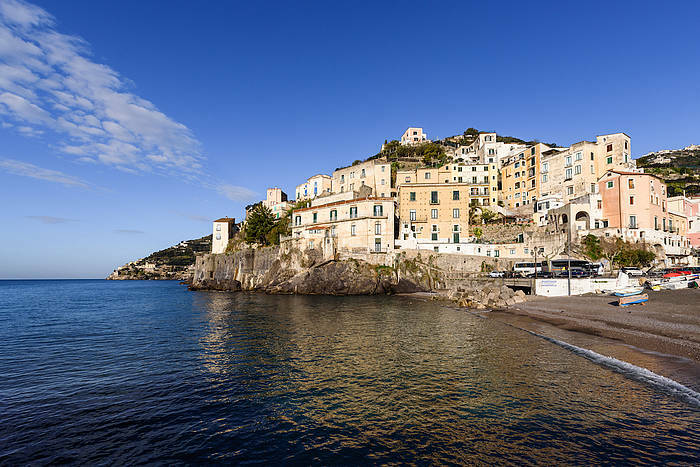 Ferry routes also run to other destinations on the Amalfi Coast, including Positano, Salerno, Capri and Ischia. 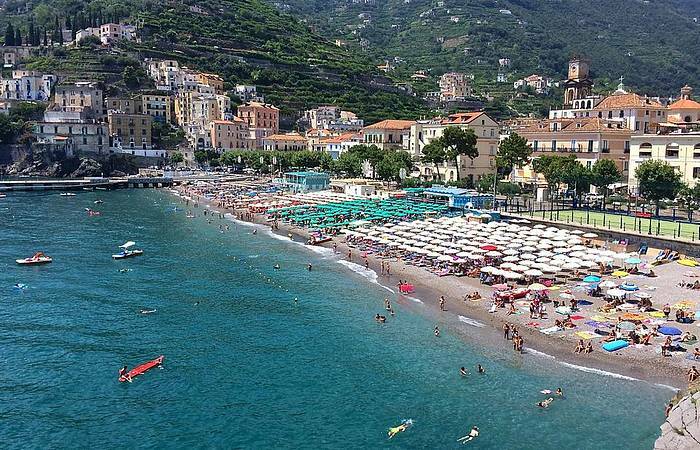 Other destinations along the Amalfi coast (like Ravello) can be reached by direct bus while Paestum, Pompei, Herculaneum are easily reachable in about 1,30h driving (we can also organize a taxi) or by public transports. Restaurants: 1 minute by foot, 20 meters/21 yards.